I am currently a Ph.D. student in the Software Engineering Group of Department of Computer and Science at University of Alabama. My advisor is Dr. Jeff Gray. My research interests line in Software Product Line Engineering, Domain-Specific Modeling Languages, Aspect-Oriented Analysis and Design. Prior to coming UA, I got M.S degree in Computer Science from University of Alabama at Birmingham on May 2010. I have worked as database administrator in Posdata Co. Ltd. for five years and as software architect in Samsung Electronics Co. Ltd. for eight years. Hyun Cho, Jeff Gray, Yuanfang Cai, Sunny Wong, and Tao Xie Model-Driven Domain Analysis and Software Development: Architecture and Functions, (Janis Osis and Erika Asnina, eds. ), Idea Group, 2010. Hyun Cho, Eunyoung Kim, and Jeff Gray International Conference on Software and Data Engineering 2010 (SEDE2010), San Francisco, CA, June 2010. Hyun Cho ACM Southeast Conference 2010, Oxford, MS, April 16~18 2010. Hyun Cho 1st International Global Requirements Engineering Workshop (GREW07), Munich, Germany, August, 2007. Hyun Cho Korean Information Science Society 2003 Spring Conference, Jeju, Korea, May, 2003. Hyun Cho Korean Information Science Society 2002 Fall Conference, Suwon, Korea, October., 2002. Hyun Cho Korean Information Science Society 2001 Fall Conference, Seoul, Korea, October., 2001..
Hyun Cho, Jeff Gray, and Eugene Syriani 4th International Workshop on Modelling in Software Engineering (MiSE 2012), Zurich, Switzerland, Jun 2012. Hyun Cho and Jeff Gray 11th Workshop on Domain-Specific Modeling), Portland, OR, October 2011. Hyun Cho, Yu Sun, Jeff Gray, and Jules White ICSE 2011 Workshop on Flexible Modeling Tools, Honolulu HI, May 2011. Yu Sun, Hyun Cho, Jeff Gray, and Jules White 2nd International Workshop on Product Line Approaches in Software Engineering (PLEASE11), Hawaii HI, May 2011. Hyun Cho, Jeff Gray, and Jules White 4th Workshop on Assessment of Contemporary Modularization Techniques (ACoM2010), Jeju Island, South Korea, September 2010. Hyun Cho SPLASH 2011 Doctoral Symposium, Portland, OR, October 2011. Hyun Cho Software Product Line Conference Doctoral Symposium, Jeju Island, South Korea, September 2010. Hyun Cho SPLASH 2011 Student Research Competition, Portland, OR, October 2011. Hyun Cho SEPG North America, Savannah, GA, March 2010. Hyun Cho ACM Southeast Conference, Clemson, SC, March 2009. 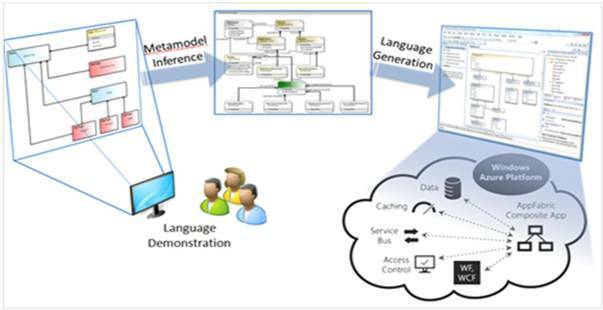 Although Domain-Specific Modeling Languages (DSMLs) have been applied successfully to various areas (e.g., finance, combat simulation, and image manipulation) and have shown improvements to productivity and quality, development of a new DSML is challenging for either computer scientists or end-users because it requires profound knowledge of the domain and deep experience in modeling language development. To address the challenges of DSML development, we propose a new approach for building DSMLs that represents a demonstration-based technique for specifying the details of a new modeling language.